Ah, the holiday season. You either hate it or you love it, where workaholics would definitely be part of the former group. Having said that, it is nice to have a little bit of fun once in awhile, and with the Halloween season coming up at the end of next month, you might want to paint the town red with ghosts and ghouls. In order to throw a real good party, not only do you need decent grub around, you would also do well to ensure that there is a free flow of booze. 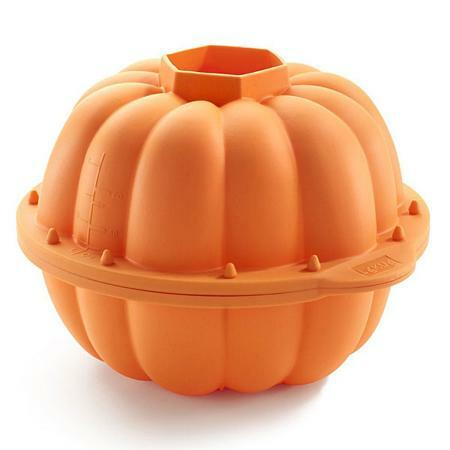 Well, supposing you are pretty good with pumpkin carving, but want to try something different, how about the $29.99 Jack-o-lantern Cake Mold from Thinkgeek? This is the perfect opportunity for you to create some clever pumpkin yumminess right there in your own kitchen, and I guess you can say that there is no more elegant method other than to make use of this Jack-o-lantern Cake Mold. It will be far different from the traditional cake pans which happen to be flat and boring, but rather, this silicone 3D cake mold allows you to bake a pumpkin cake that would – of all things, look like an actual pumpkin, now how about that?